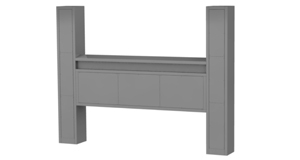 Service distribution units (or service spines) are made of AISI 304, complete with a plinth and access doors. SDU units are made-to-measure. Design flexibility and solid know-how in made-to-measure production allows us to process your most demanding commercial kitchen ventilation project using Nuventas as a single supplier, which allows to keep the costs down and have a complete control over the quality. Service distribution units are constructed from AISI 304 stainless steel. AISI 430 option is also available. The dimensions of tailor-made SDU units depend upon your requirements.